I’ve been doing art full time for four years now, and ever since the day I graduated in 2012, I’ve been visualizing what success will look like for me. 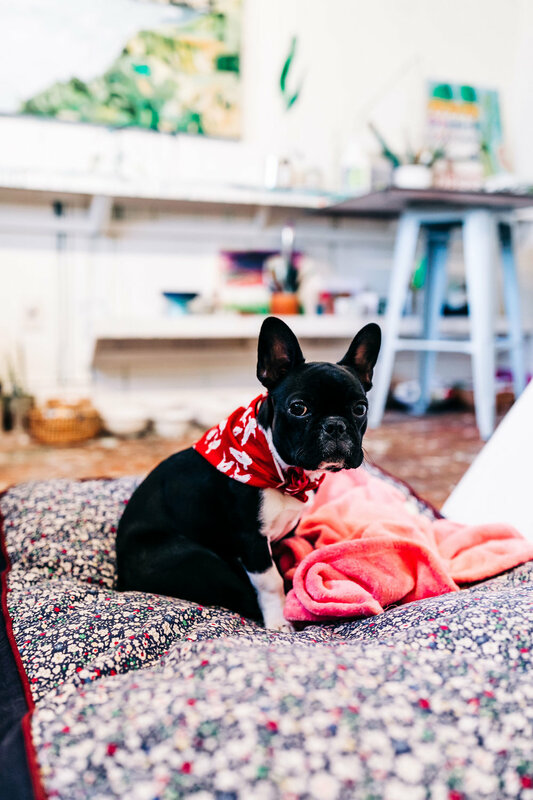 That vision of where I want to go in the future always involves a beautiful, naturally lit, airy + inspiring studio space, and in it, I’ve always visualized a studio dog there with me. For as long as I can remember, I’ve wanted a French Bulldog. I used to visit my sister in New York City, and I remember the first time I saw one of these quirky little dogs, I fell totally in love. They were just the most ridiculous and adorable little creatures, and every time someone would pass me with one, I would have to stop, get down on the ground, and talk to them. 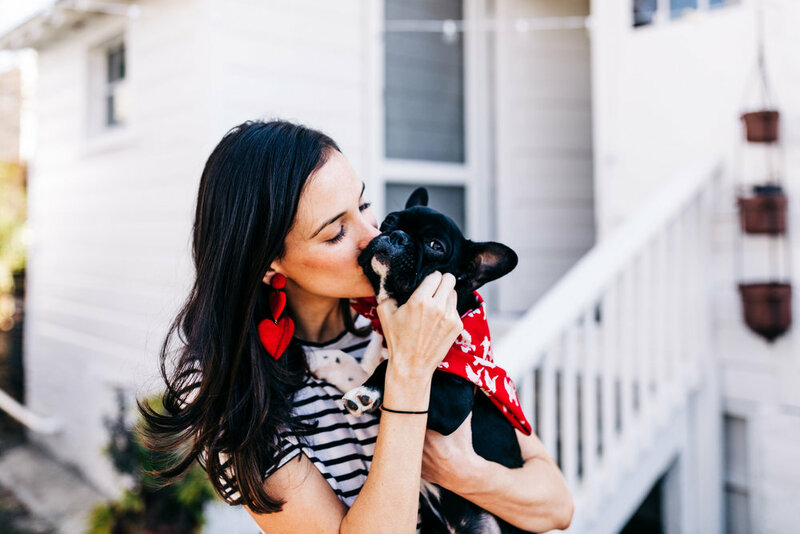 Getting a Frenchie of my own became the symbol of my goals and dreams, that milestone to reach for which would mean I’d really succeeded in making art my career. I love when you walk into a store or a studio and there’s a dog. 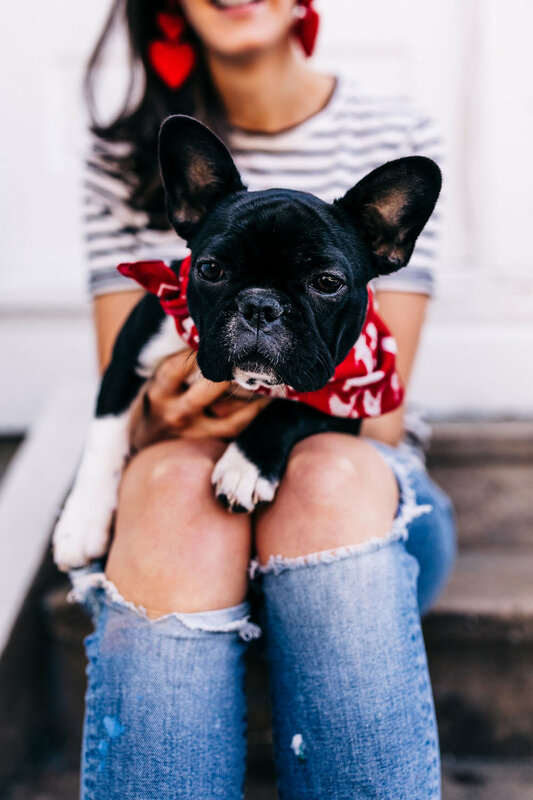 Every time I would walk into this fabric store in Greenville and a little Frenchie would come greet me, I would feel like it was fate. I’ve always been an animal person, but I never had a dog of my own. I’ve been talking about getting one for years, but until now, I was never quite there financially. It always seemed just a little bit outside my reach, but it was also a really clear goal that I was working toward. 2018 was a great year for me professionally, and I finally reached a place where it was time to pull the trigger. It was time to get my Frenchie. I got online and found a breeder and went the next morning, and Lucy has been rocking my world ever since! Having a funny, quirky little dog around is bringing so much joy to my life and my work. She’s 4 months old and snores like a 90 year old man! She’s definitely got a Napoleon complex and already runs through the studio like she owns the place. She already ate the beginning of a commission and has already gotten herself covered in paint. And I couldn’t love her more! I’m so proud to have brought her into my life. Getting Lucy feels like my first real, fully adult responsibility. I finally had the funds to make my dream come true, and I still can’t quite believe it’s happened. Every day when I look at her, I have this moment of realizing that I made it to that really big goal of mine. It’s so important to celebrate our successes! Lucy is truly the symbol of my dreams come true, and I’m so grateful to have come this far and to have this little companion to help me along the journey ahead. The Studio of My Dreams!